Size matters... (Tee-hee!) You've NEVER had this much fun with something this tiny. Thought you had to choose between a fancy cocktail party and the fun party cup drinking games with shots and shooters at your party? Add some sass and class to your next event! A good shot always goes down nice and easy. Drink enough of them and you will too. One tequila, 2 tequila, 3 tequila, FLOOR!!! 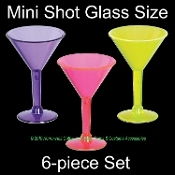 Any occasion is special with our fun miniature Martini shot glasses. Great for girls night out, bachelorette party, hen night, birthday celebrations, graduation, pool, beach, Luau, Rave clubs, Halloween props, costume party favors, event supplies, restaurant decorations and more! *NOT marked dishwasher safe, so recommend HAND-WASH only.